OnTopOfJunkMountain doesn't have any items in their booth! Fantastic person to trade with! A person of high integrity. Buy with confidence! Ellie is just the greatest. A super nice Bonanzler. What everybody below (and probably everybody above) has written. If you make a purchase from her, I predict she will display the type of integrity, benevolence and ability we all dream of when we do business on the internet. Sellers like this are what Bonanzle is all about and have to make Bill and Mark proud. This lady is one of the best sellers here, She’s very sweet, Goes the extra mile, Can’t be beat! One of the best people on Bonanzle. Very friendly, fast and professional service—not just with a smile, but with laughter! Very good seller to deal with. Iam a repeat buyer & I just had to leave anther personal endorsement.Bonanzles Best 10 Star Seller. Always Fast Shipping and Fantastic Communication.She Absolutelly Wonderful. She truely is Very kind and caring and very very Professional. 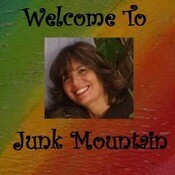 Love doing business with OnTopOfJunkMountain. Highly reccomended.Everyone,please do check out her booth. She awesome items. Thank You OnTop for anther Great Bonanzle buying experience. You are TOPS! One of the kewlest people around town. never hesitate when ellie is involved, if she crosses your path, you have been touched by an angel. Eleanor is an excellent member of the Bonanzle community. Professional all the way. Highly recommended, deal with confidence! A++! wow! an incredible woman who graciously spent her time sharing her computer knowledge with a ‘computer stupid’ person! she walked me through the parts i could learn, and did the rest for me. thank you sooooooo much!!! She is honest, and very helpful. Any questions I have had she will take time to help find the answer. She has a great sense of humor. She is very professional and a highly recommended seller. Thanks for everything. A most professional yet warm and friendly person/seller. Great items, fair prices, excellent packing/shipping and all with that warm personality. Overall a Most Positive person to do business with and get to know. Thank you. Very interesting “About me” introduction. Just stay and take a look at your products here. What a Great Lady to work with. Always Helpful to anyone who asks. Bonanzle would not be the same without her. Absolutely one of the nicest persons i’ve ever met! I’m dead from the neck up and she has helped me immensely.. A great person to know with unlimited encouragement to all.. She has become a great friend and i am blessed to have met her.. Thank you otop! Excellent Bonanzler, an asset to the community. Fast payment, great communication, a pleasure to do business with! A++! Fantastic asset to Bonanzle, Very honest, I highly recommend this seller. Quality items, great prices. Repeat Customer here. I highly recommend this Seller !! Fast Communication, Excellent prices, Super Fast Shipping, She is an Immense Asset to Bonanzle! One of the nicest people to do business with. Professional, nice and very patient with old folks like me. Very helpful!